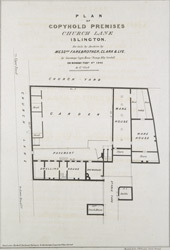 This is a plan of property for sale on Church lane, near Lower Road in Islington. The sale is to take place at Garraways Coffee House. Garraways was famed as one of the major auction houses of the City. Tea was sold here for the first time in England in the 1670's by Thomas Garraway, costing £10 a pound.